We went to see Ireland play France last week in Croke Park. I was lucky enough to get three standing tickets for Hill 16, where we had a great view. It was a heartening victory for Ireland, and Croke Park was magnificent. I would like to comment on the cost of the tickets though. Standing on Hill 16 was E38, while all other tickets, which are seated, were E90. That is just a ridiculous amount of money. Croke Park has a capacity of 82,300. Allowing for 13,000 on Hill 16 and Nally Terrace (Railway End), this means that approximately 70,000 seats were available at E90 each. It really just goes to show how much money there is in rugby. In contrast, tickets for the Ireland vs Georgia world cup qualifier were just E50. (Still too expensive in my opinion). In return for the rugby ticket, my other half today bought me a pair of shoes! He knows me too well. 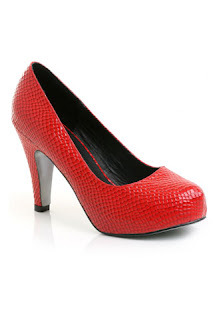 We were wandering in Debenhams in Waterford when he saw a red pair of platform courts on offer in the Faith concession. As today is Valentine's Day, they were on special offer for E45 and are absolutely lovely. The glossy red mock-croc leather just cries out to be loved.